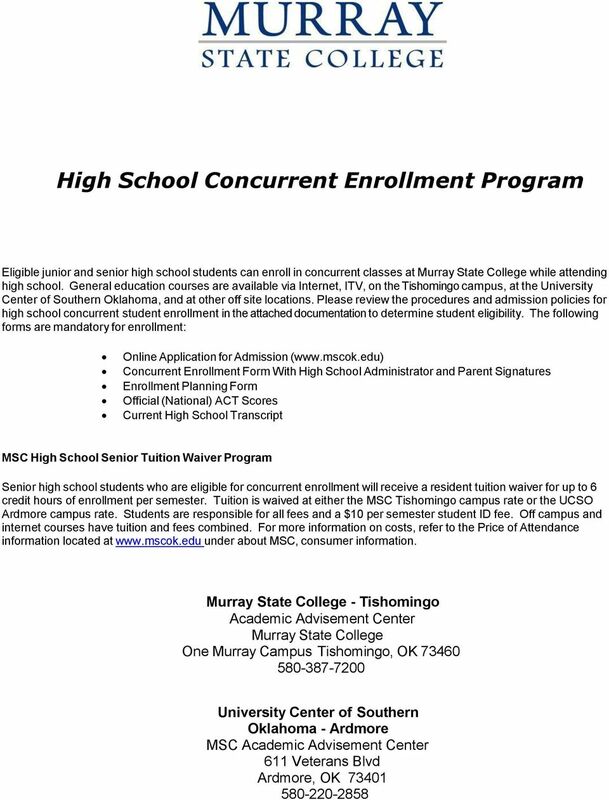 Download "High School Concurrent Enrollment Program"
3 Murray State College PROCEDURES FOR ADMISSION OF HIGH SCHOOL CONCURRENT STUDENTS Step 1: Student must complete an online MSC Application for Admission. 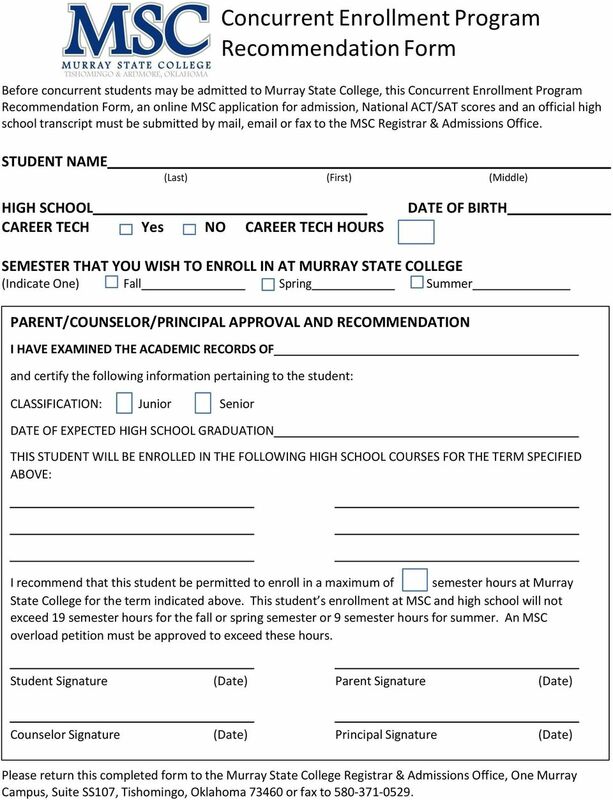 ( Step 2: Student must complete a MSC Concurrent Enrollment Form signed by the student, parent/legal guardian, high school counselor and high school principal. 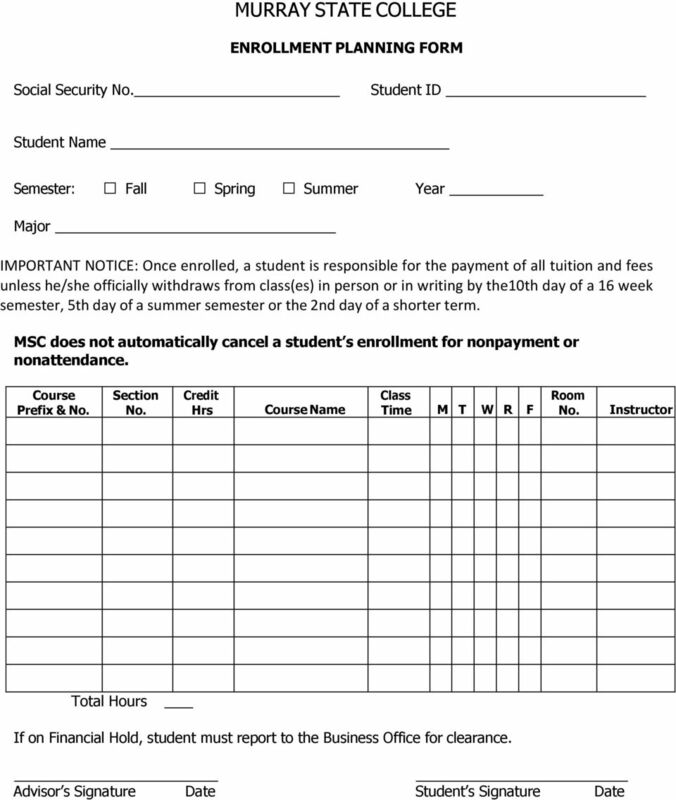 Step 3: Student must complete a MSC Enrollment Planning Form signed by the student. Step 4: Student must submit an official high school transcript (with high school GPA calculated by high school) and National ACT (SAT) scores. NOTE: (a) There is no secondary assessment for students who do not meet National ACT (or SAT) criteria. (b) Also, high school students may not enroll in zero-level courses designed to remove high school curricular deficiencies. Senior Student Eligibility ELIGIBILITY & POLICY INFORMATION TO BE ELIGIBLE FOR CONCURRENT ENROLLMENT, A HIGH SCHOOL SENIOR MUST: 1. Have participated in the National American College Testing (ACT) program and scored a minimum composite of 19 or the equivalent on the Scholastic Aptitude Test (SAT) or have a high school GPA of If your ACT composite is not a 19 or higher you must have at least a 3.0 high school GPA and a sub-score of at least 19 in the appropriate subject area. For example: 19 in the English ACT subscore to enroll in English courses; 19 in the Math ACT subscore to enroll in math courses; 19 in the Science ACT subscore to enroll in science courses; and 19 in the Reading subscore area to enroll in other college courses 3. 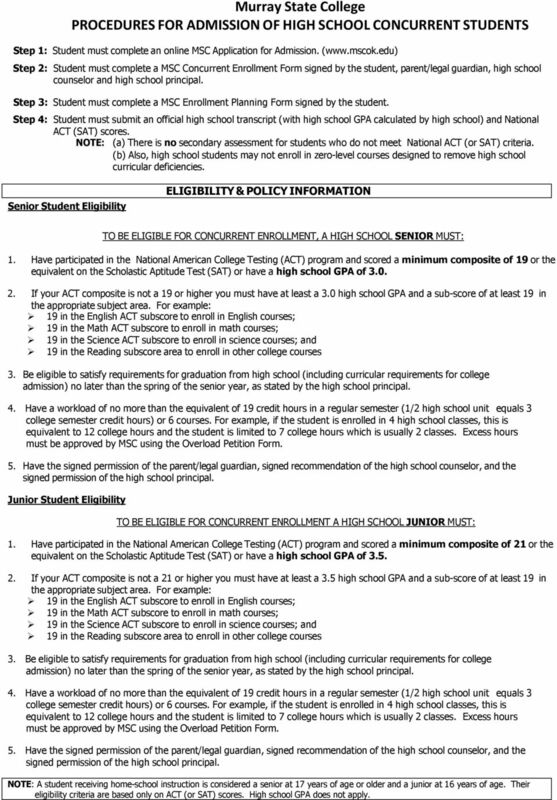 Be eligible to satisfy requirements for graduation from high school (including curricular requirements for college admission) no later than the spring of the senior year, as stated by the high school principal. 4. Have a workload of no more than the equivalent of 19 credit hours in a regular semester (1/2 high school unit equals 3 college semester credit hours) or 6 courses. For example, if the student is enrolled in 4 high school classes, this is equivalent to 12 college hours and the student is limited to 7 college hours which is usually 2 classes. Excess hours must be approved by MSC using the Overload Petition Form. 5. Have the signed permission of the parent/legal guardian, signed recommendation of the high school counselor, and the signed permission of the high school principal. Junior Student Eligibility TO BE ELIGIBLE FOR CONCURRENT ENROLLMENT A HIGH SCHOOL JUNIOR MUST: 1. Have participated in the National American College Testing (ACT) program and scored a minimum composite of 21 or the equivalent on the Scholastic Aptitude Test (SAT) or have a high school GPA of If your ACT composite is not a 21 or higher you must have at least a 3.5 high school GPA and a sub-score of at least 19 in the appropriate subject area. For example: 19 in the English ACT subscore to enroll in English courses; 19 in the Math ACT subscore to enroll in math courses; 19 in the Science ACT subscore to enroll in science courses; and 19 in the Reading subscore area to enroll in other college courses 3. Be eligible to satisfy requirements for graduation from high school (including curricular requirements for college admission) no later than the spring of the senior year, as stated by the high school principal. 4. Have a workload of no more than the equivalent of 19 credit hours in a regular semester (1/2 high school unit equals 3 college semester credit hours) or 6 courses. For example, if the student is enrolled in 4 high school classes, this is equivalent to 12 college hours and the student is limited to 7 college hours which is usually 2 classes. Excess hours must be approved by MSC using the Overload Petition Form. 5. Have the signed permission of the parent/legal guardian, signed recommendation of the high school counselor, and the signed permission of the high school principal. NOTE: A student receiving home-school instruction is considered a senior at 17 years of age or older and a junior at 16 years of age. Their eligibility criteria are based only on ACT (or SAT) scores. High school GPA does not apply.